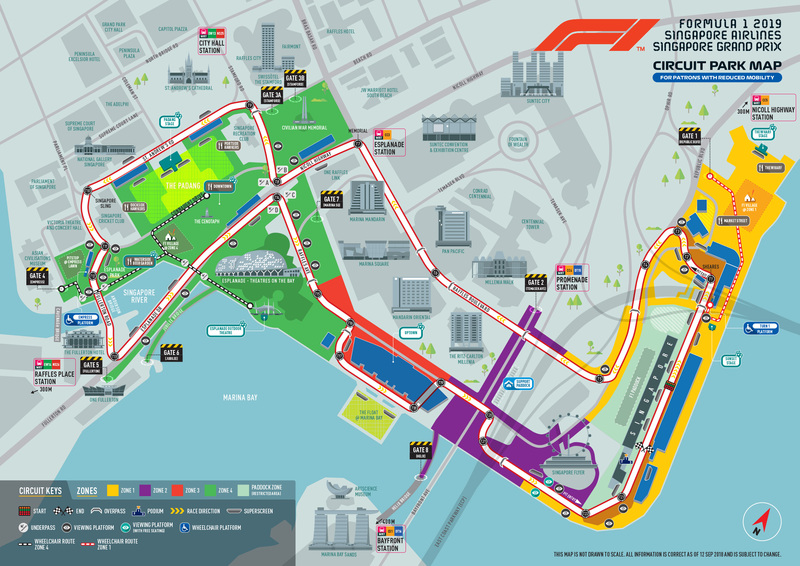 The event guide for the FORMULA 1 SINGAPORE AIRLINES SINGAPORE GRAND PRIX 2019 will be available soon. Please check back for more updates. Download the official Singapore GP mobile app here for your personal race weekend guide. mailing list for the latest announcements and updates. Ditch the car and take the public transport instead – all gates are within walking distance to a MRT station. Refer to your ticket for the nearest gate(s) and plan your route accordingly. Plan your journey to and from the Circuit Park with the help of our transport guide here. Train and shuttle bus services will operate on all three days of the race weekend. Zone 1 patrons can also take the free shuttle bus between Lavender MRT Station and Gate 1 (Republic Boulevard). Public buses servicing the vicinity of the Circuit Park may be disrupted. Designated pick up and drop off points are assigned to private hire car services (Grab). Please refer to the LTA advisory here for details. Patrons with All Zones tickets may enter through any gate. Patrons with Zone 3 (Bay Grandstand) tickets may only enter through any Zone 4 gates. Please note that Zone 3 patrons cannot enter via Gate 8 on the Helix Bridge as this is in Zone 2. Patrons with Zone 4 Grandstand or Walkabout tickets may only use Zone 4 gates. Comfort is key. Dress to keep cool in Singapore’s balmy weather and put on sunblock. Put on a comfortable pair of walking shoes to explore the Circuit Park, from the on-track action to exciting performances by international and local artistes to an exciting selection of entertainment, merchandise, as well as food and beverage on offer. Bag checks will be conducted at all gates. Pack light for a speedy clearance during the security screening. Patrons are not permitted to bring in their own food and beverages, except for one clear plastic bottle of soft drink or mineral water of not more than 600ml per person. A non-exhaustive list of prohibited items is listed in Clause 8 of the Conditions of Sale & Entry. *Establishment of Temporary Restricted Area for the Conduct of Aerial Activities during Formula 1 2018 Singapore Airlines Singapore Grand Prix: Please note that all unauthorised aerial activities (such as flying of drones and kite-flying) are not allowed within and around the Marina Bay Street Circuit from 14 - 16 Sep. Visit www.caas.gov.sg for more information. All patrons, including children, must have a valid ticket for entry. Children under the age of 7 are required to have a signed indemnity agreement for admission into the Circuit Park. The indemnity form can be obtained at the gates or here. The signed indemnity form must be given to the staff at the gates prior to entry. For the benefit of all patrons, do not use tripods, monopods or tablet devices on the grandstand. Umbrellas are only allowed for use on grandstands if it rains heavily. They can’t be used on grandstand stands for sun protection as it obstructs the view of other patrons. Some of the best racing action can be viewed from elevated trackside platforms (bleachers) that are strategically located around the street circuit. Take a look at the Circuit Park map and explore the area to find your favourite spot! Try out various fun activities across all zones – race simulators, Pit Stop Challenge where fans can change the tyres of a replica Formula 1® car, complimentary Airbrush Tattoo booths and a myriad of roving entertainment and photo opportunities await! Ultra-hip and modern, The Wharf oozes industrial charm with containers offering delectable culinary delights, airbrush tattoos, games and other exciting activities. Get groovin’ with the international acts performing at The Wharf Stage (previously know as Village Stage), including Simply Red, Joe Hahn of Linkin Park, The Sugarhill Gang and Björn Again. Located in the Civic District, the new Pitstop @ Empress Lawn in Zone 4 boasts specially curated expereinces for both adults and kids – silkscreen printing, origami and paper marbling workshops; drum clinics; a maze challenge; classic games and more. An eclectic line-up of DJs and bands are set to keep your hearts racing as they take to the stage in Uptown, located at the undercroft of Bay Grandstand in Zone 3. Dance the night away or chill out with a cold drink at the bars and restaurants in the area or challenge yourself at the exciting interactive game kiosks. With its stunning backdrop of downtown Singapore, the Marina Bay Street Circuit is a photographer’s paradise. There are plenty of locations where you can find that perfect shot – go out and explore the Circuit Park! All equipment brought into the Circuit Park should only be for personal use and not for commercial purposes. Go early to secure a spot in the Fan Zone to get up-close to your favourite Padang Stage artistes. Entry to the Fan Zone is on a first come, first served basis from when the gates open. Do note that you can exit the Fan Zone at any time, however you may not be able to re-enter once the Fan Zone has reached its maximum capacity. Get your cameras ready – look out for a spectacular fireworks display that will light up the Marina Bay skyline once the chequered flag is waved on Sunday! Official Singapore Grand Prix and Formula One™ Team merchandises are available for sale at merchandise stores located throughout the Circuit Park. Go on a gastronomic adventure with the wide range of restaurants and bars at Market Street Global Cuisine (Zone 1), Uptown Village under the Bay Grandstand (Zone 3), as well as the Portside Hawkers and Dockside Hawkers (Zone 4). Food options for vegetarian and halal guests are also available. We recommend bringing cash as only selected vendors accept credit card payment. ATMs which accept most local and international cards are located around the Circuit Park. Much of the Circuit Park is accessible to patrons in wheelchairs or with limited mobility. We recommend that you familiarise yourself with the limitations on access and movement due to the complex geography of this street circuit. The dedicated (ticketed) Wheelchair Accessible Platforms provide ramped access to the viewing area that caters to the patron with wheelchair and a carer. Each patron of the dedicated Wheelchair Accessible Platforms can have up to two companions who must each be holding the same ticket for entry. Seats beside the wheelchair slots will be provided for these companions. There are numerous Wheelchair Accessible restrooms within the Circuit Park. Please refer to the Circuit Park Map for all locations. Some restrooms are temporary (portaloo) type, others are located within our stakeholder’s premises (eg. Esplanade Theatres on the Bay). Wheelchair Accessible Platforms have a dedicated restroom immediately by the platform. Plan your arrival at the Circuit Park carefully and if possible use public transport. The Marina Bay Street Circuit has excellent MRT (underground train) access. Due to the road closures, there are strict limitations on arrival by private vehicle or taxi, it is not possible to be dropped off at Gates. Please refer to the map for patrons with reduced mobility for recommended routes around the Circuit Park. Turn 1 Wheelchair Accessible Platform ticketholders can access Zones 1 and 2 via Gate 1. The distance from Nicoll Highway MRT station to Gate 1 is 470m. Once within Zone 1 patrons can access the Singapore Flyer using the tunnel under the track in between Turns 2 and 3. To access Zone 4 (e.g. to view the Padang concerts) we recommend that wheelchair patrons exit Zone 1 through Gate 1 and take the MRT. Patrons can re-enter the Circuit Park through Gate 4 (closest MRT: Raffles Place). From here, patrons can access the Padang and Esplanade Park via the underpass at the foot of the Anderson Bridge. Empress Wheelchair Accessible Platform ticketholders should access Zone 4 via Gate 4. Gate 4 is located close to Raffles Place where there is access both to MRT, taxi services and vehicle drop off. In addition, patrons with mobility issues can access the wheelchair-accessible platform at the Padang in Zone 4 to catch the nightly concerts at the Padang Stage, on a first come, first serve basis. Overpasses do not have lifts for wheelchair access nor does the main underpass that connects the four sections of Zone 4. For patrons with mobility issues that do not require wheelchairs, please consider the distances involved when getting to the Circuit Park as well as moving within the Circuit Park in crowds. For a list of recommended Grandstands to meet your needs, do contact tickets@singaporegp.sg or call the Ticketing Hotline at +65 6738 6738. As medical resources in the Circuit Park are dedicated to medical incidents, we are unable to provide transport services (i.e. buggies) within the Circuit Park. Visually impaired patrons are welcome to enter with Guide Dogs. Should you wish to do so, please inform us in advance so that we can make provision at the gates to facilitate your access. Meeting the needs of patrons with disabilities is a priority for Singapore GP Pte Ltd, please contact us at tickets@singaporegp.sg should you require any assistance or further information. All information is correct as of 5 October 2018 and subject to change. The Singapore Grand Prix is a rain or shine event. Ponchos are available for sale at Singapore Grand Prix Official Merchandise Booths and Information Booths. Please note that umbrellas are only allowed for use on grandstands if it rains heavily. We do not allow umbrellas to be used on grandstands for sun protection as it obstructs the view of other patrons. Approach our staff at the various Information Booths around the Circuit Park for any queries or requests. In the event that you lose an item, please report to the nearest Information Booth. Do note that we are unable to retrieve items under the grandstands until after the day’s activities. Should you feel unwell during the event, please proceed to the nearest First Aid Booth. The most common first aid incidents are blisters (from walking in inappropriate footwear), mild dehydration and sunburn. Please take appropriate prevention measures to ensure you have a smooth and enjoyable experience during the event. We would like to thank all patrons who have submitted feedback forms or contacted us with their suggestions to improve the event. If you need any information or have tips to share with us, please contact us at info@singaporegp.sg or call +65 6738 6738 or approach any of our ushers in the Circuit Park during the event. You can also check out the Frequently Asked Questions section for answers to questions you may have here.